The American River was the site of the original gold discovery in California. On January 24, 1848, James Marshall discovered flakes of gold at Sutter’s Mill, located along the banks of the South Fork American River. Despite his attempts to keep the discovery quiet, work got out, and by the summer of 1849, hundreds of thousands of hopeful prospectors were coming to California from all around the world. The river system is divided into three main branches; the North Fork, Middle Fork, and South Forks. They are located in El Dorado, Placer, and Sacramento Counties. The gold bearing parts of the river include nearly all of the headwaters that feed these main forks as well, which originate in the rich high country of the Sierra Nevada Mountains. There are literally thousands of miles of gold bearing rivers and streams that make up the American River drainage. Additionally there are many dry gulches and lode gold deposits that have potential for gold. While many of these deposits have been discovered and are actively being mined, many of them are long abandoned and now open to recreational prospecting. In addition, there are certainly some rich gold deposits throughout the Mother Lode that are yet to be discovered. One of the most popular areas along the American River for recreational prospectors to explore is the Auburn State Recreational Area. It covers many miles of the North and Middle forks of the American River, and provides excellent opportunity for recreational gold prospecting. Keep in mind that this area is open to a variety of recreational uses including fishing, whitewater rafting, hiking, biking, OHV use, and many other recreational pursuits. It is important to consider this when mining in the area, and be respectful of other people. There are quite a few regulations in place here. At the present time, suction dredging in all of California is banned, which includes the Auburn State Recreation Area, so dredging is not allowed. Additionally, there are various restrictions on equipment sizes, where you are allowed to dig, and such. Prior to prospecting here, it would be advised that you contact the main office of the Auburn State Recreation Area located in Auburn, California to get the latest updates on any rules and regulations regarding rules on prospecting. 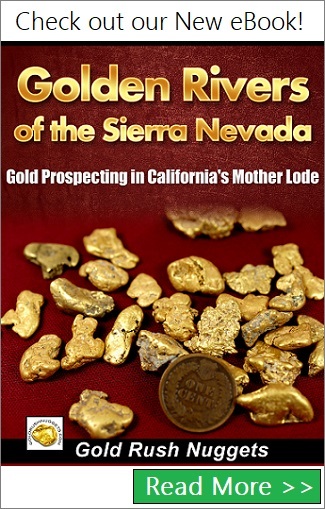 Since the discovery of gold at Sutter’s Mill, there have been millions of ounces of gold recovered from the Sierra Nevada’s, with some of the richest ground located right along the American River. Miners have successfully recover gold here using many methods. Hydraulic mining is a well-known method that was used here for many years before it was permanently banned. While the practice was detrimental to the environment, it was responsible for huge amounts of gold recovered. The powerful jets of water washed away large bench gravel deposits that were unworkable any other way, releasing the gold within the gravels. These old hydraulic pits can be prospected using metal detectors quite effectively. Bucket Line Dredges also worked many of the rich gravels along the American River. Huge amounts of gold were recovered, along with some minor amounts of native platinum as well. The dredging operations started up very late in the 1800’s, and continued on and off for years. The last dredge working along the American River operated as late as 1962. Great prospecting opportunities still abound in this part of California, due mainly to the sheer amount of rich gold ground in this region. Keep in mind that much of the land will be actively claimed, but with a bit of research it is still possible to find areas that are unclaimed and still open.